For as long as I have had this blog (about 4 years) I have not had my hair this short and this light! After the wedding I knew I just wanted something completely different, so pinned a few ideas and took it to my hairdresser. 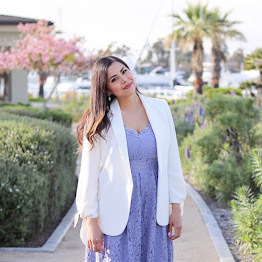 Fittingly, the weather here in San Diego has been hot, so I put some of my favorite Spring pieces together and debuted my hair! This blazer is from the newest Cabi Spring 2016 collection and is fitted and light-weight. If you followed me on Snapchat back in January you were probably witness to one of the funnest runway shows when I attended #CabiScoop (see the video below to get a sense of the fun. When I saw this blazer walk down the runway I made a mental note that I needed this jacket in my life! I never knew how much I needed a gold handbag until I got this one from Galian and realized I could pair with the majority of my wardrobe. It has a crossbody option, and fits lots of stuff inside. They also have other color options that an affordable price are too good to pass up! No, really, I got it in another color too! About the Outfit: Cabi "Cruise Jacket" (here) | Miss Match Boutique Dress (similar here) | ShoeDazzle Sandal Heels (here) | Galian Handbag "Charlton Small Tote (here) | Karen Walker sunglasses (here) | Pictures by fellow blogger www.lauraneuzeth.com. Love that jacket. It really does add the right amount of nautical to this outfit. Your hair color is absolutely beautiful on you, btw. It's kind of like a caramel color...love it! Beautiful dress and great jacket. Also adoring the new lighter hair mama. You look bella as usual. I love the lighter locks, they really suit you! Amazing outfit. love the jacket and the gold details.